The Cartier Crash was first introduced in 1967 and, differently from what most people think, it was not inspired from Salvador Dalí paintings but from a damaged Cartier Bagnoire Alongee watch that was on the wrist of a Vice President of Cartier London when he was involved a in fatal car crash with flames melting the watch on his wrist. 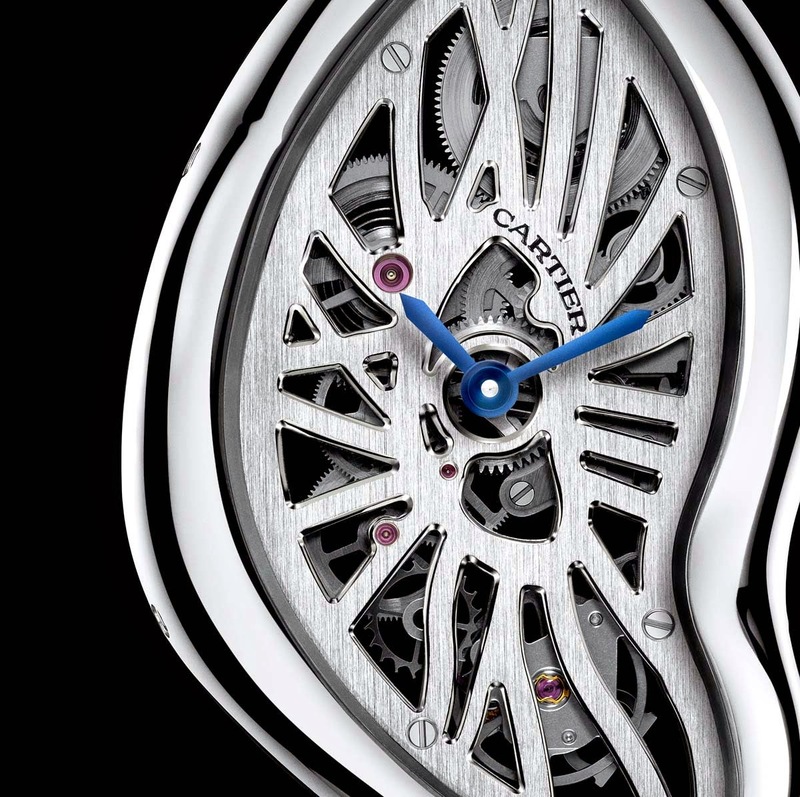 As a tribute to their fallen colleague, Cartier of London decided to introduce the design of the crashed watch as a new model. The Cartier Crash was born. With its asymmetrical dial, the Crash watch soon became a collector’s piece, produced in very limited editions. There is now a new variation of this iconic watch with the Cartier Skeleton Crash, a model where the mechanical movement is also "crashed" to perfectly adapt to the irregular shape of the precious 950/1000 platinum case (28.15 mm x 45.32 mm). 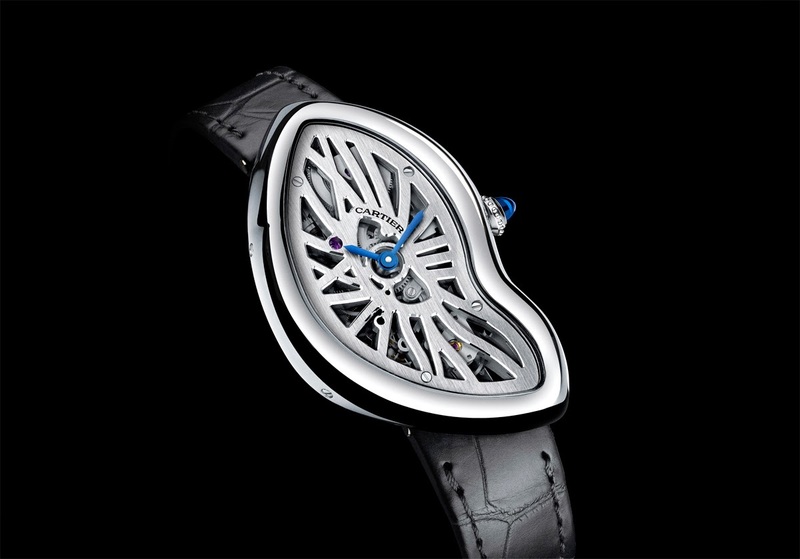 The Skeleton Crash will officially debut at the Salon International de l'Haute Horlogerie in Geneva next January. The dial is completely skeletonised, covered with oversized Roman numerals that reveal the movement beneath: the hand-wound calibre 9618 MC beating at 28,800 vibrations per hours and offering a remarkable power reserve of 3 days. Not a traditional movement that has simply been modified to adjust to the shape of the case, the calibre 9618 MC was expressly designed as an openwork movement, conceived by watchmakers to achieve the best effect in terms of arrangement and aesthetics. 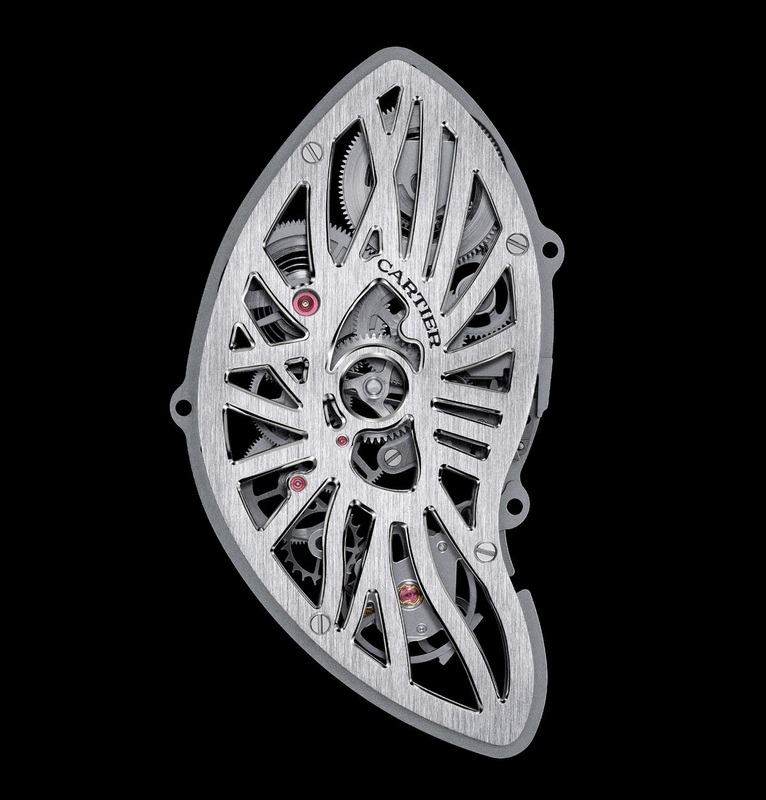 Considering the large number of surfaces created by the design of the movement and the skeletonising of the plates, it is easy to imagine how challenging have been the various operations of chamfering, polishing and satin-finishing. On the back, the gear trains can be admired through the sapphire crystal. 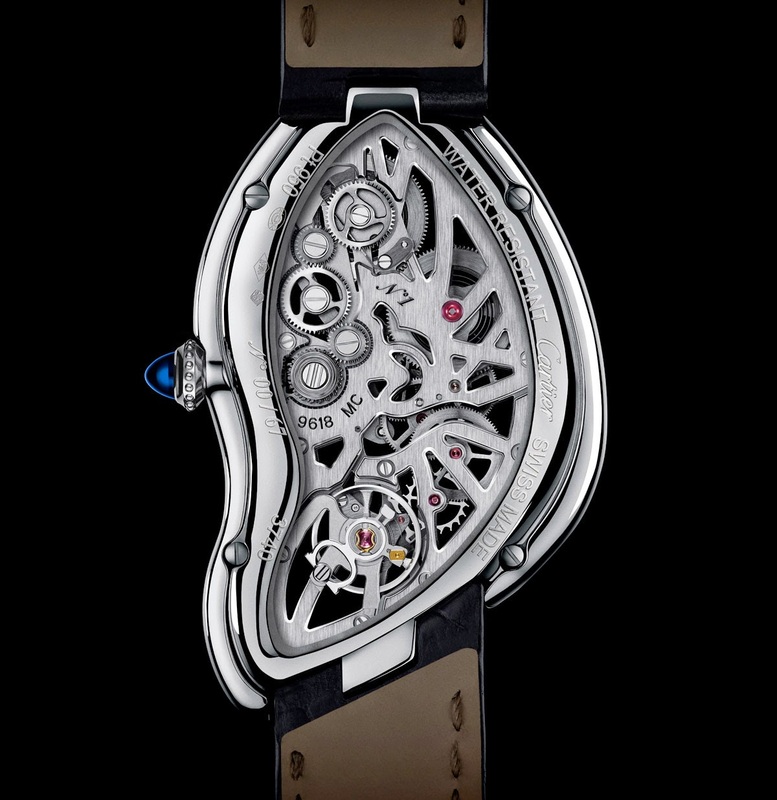 The Cartier Crash Skeleton in platinum is a limited edition of just 67 pieces with a retail price of Euro 50,000 / US$ 62,500. Another platinum version with diamond-set bezel will be available in 67 pieces. 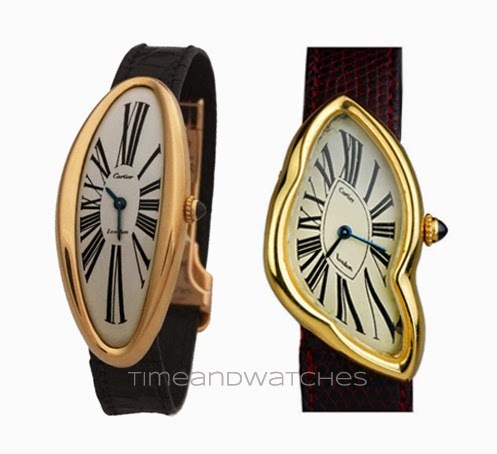 A Cartier Bagnoire Alongee on the left and an original Cartier Crash dating back to 1967. Note the word "London" signed on the dial: at the time Cartier London was a separate entity from Cartier Paris and Cartier New York. This watch is fascinating but it is a sad story. I think it was somehow unfair to take advantage of a fatal accident. 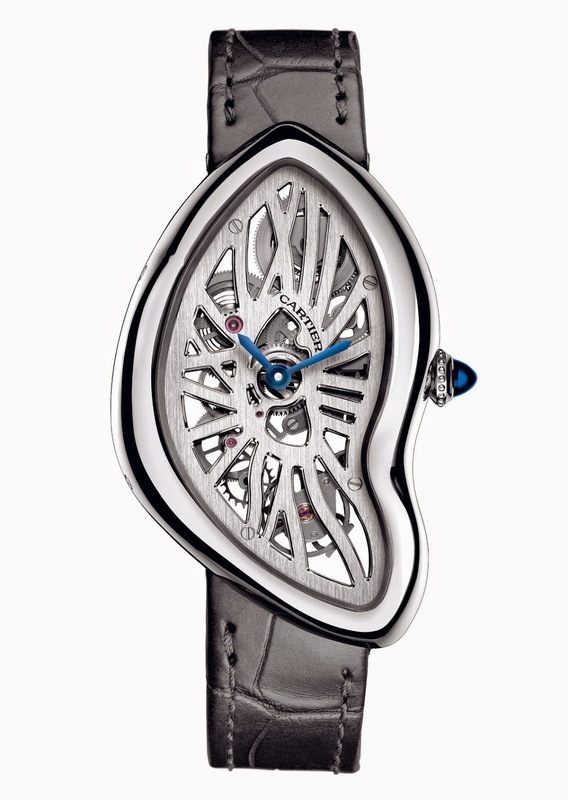 Cartier of London decided to produce a limited number of pieces reproducing the damaged watch as a sort of tribute to the colleague. No one expected the success that the watch later experienced. 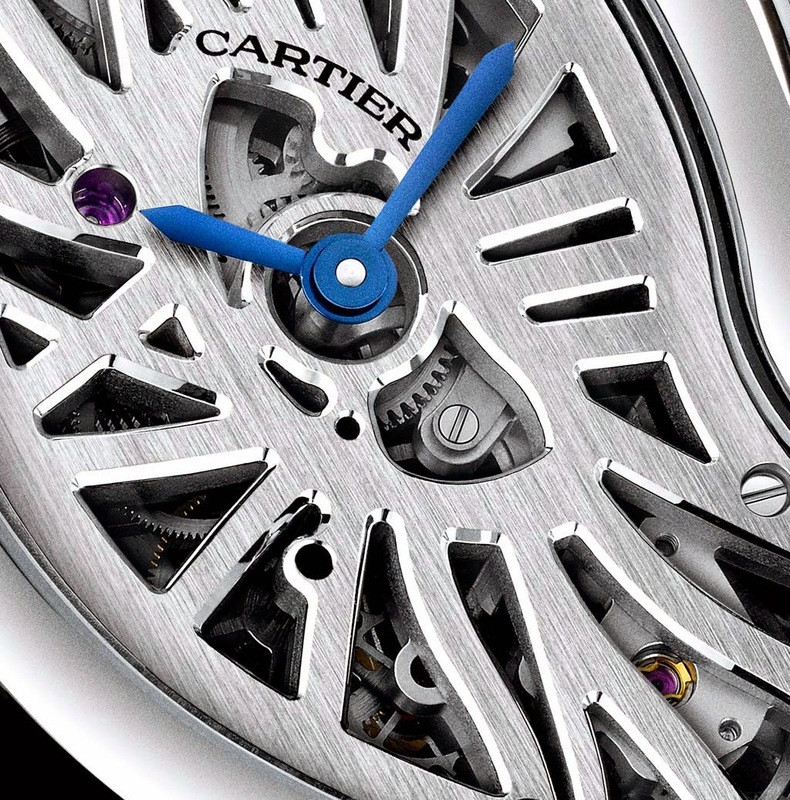 Pre-SIHH 2015: Cartier Skeleton Crash. The Cartier Crash was first introduced in 1967 and, differently from what most people think, it was not inspired from Salvador Dalí paintings but from a damaged Cartier Bagnoire Alongee watch. There is now a new variation of this iconic watch with the Cartier Skeleton Crash, a model where the mechanical movement is also "crashed". The Cartier Crash Skeleton in platinum is a limited edition of just 67 pieces with a retail price of Euro 50,000 / US$ 62,500.